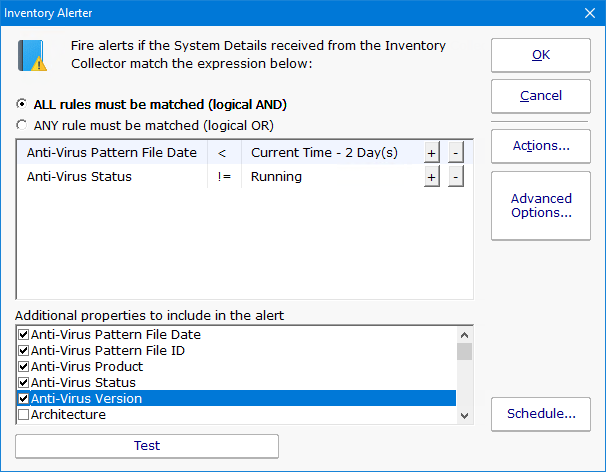 The Inventory Alerter monitor runs checks against the inventory database which was filled by the Inventory Collector monitor. 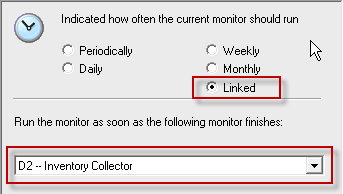 Because they work so closely, the Inventory Alerter's schedule is usually linked to the Inventory Collector, so it runs as soon as the Collector finishes. The Inventory Alerter is basically an expression builder that lets you specify a list of rules to check for the target server. If the rules match, the monitor's actions are fired. The example below shows a possible check of the anti-virus software running on the target server. 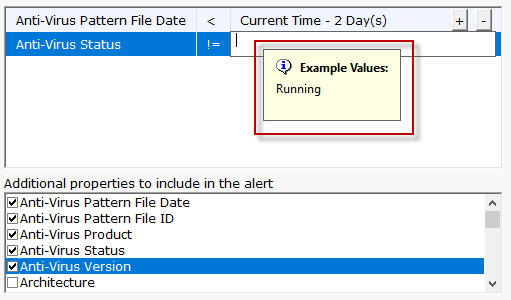 Many of the possible values for an inventory property would be hard to guess, so you can hover over the field to see a list of example values in the database for that value. Besides specifying property match values, you can also indicate which additional properties should be shown in alert messages. This often helps give context to what is wrong with the present value of the property. For example, by including the Last Boot field when there are pending updates, you might discover a computer isn't rebooting as expected. You can also detect and be alerted to hardware changes in a target computer. For example, you could detect if RAM was added or removed. Watch the training video How to Monitor Anti-Virus and alert when Pattern File Date is out of date.